In the top right corner of your farm you will see a little drop down menu that shows you your stats! Click on it to reveal the stats for your farm! Hover over each box for it's title or see below for explanations! You can also see your neighbor's stats in the bar under your farm when you hover over their picture! 2. Ribbons. Click it to get a drop down glance at how many you have of each ribbon at that level. The top number is a cumulative total number of ribbons earned. 3. Masteries. Click to see drop down of what mastery level all your crops are at! Its really tiny but, 3 Star masteries are the first number in the drop down list. The top number is your cumulative total number stars earned. 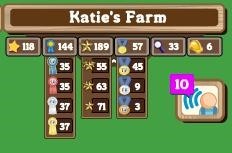 Notice that you can have more stars than you have crops available. 4. Medals. Click to see drop down of how many bronze, silver, and gold medals you've achieved for Co Ops. The top number is cumulative. 5. Collections. Not sure what this is counting yet as mine is only at 29 but my cunning collector ribbon is at 1191. My guess is that it started counting the ones I traded in at some point within the last couple days when this feature was released. 6. Constructed buildings. These are the ones you had to ask your friends for the materials for. Mine shows six. There is no detail but I assume this is counting: Beehive, Stable, Nursery(x2), Garage, Pigpen. The botanical garden and maison that are probably in your storage do not count for this (I took them out to check). I assume this is because they don't really do anything other than look pretty whereas the others are buildings you can interact with! The constructible barns don't count either. You can see 3 sets of stats at once, the rest don't drop down. I think it's kind of exciting to see it all in one place! Will this make you more willing to try to master more crops, co-ops, and ribbons? News: One Who Lives in Farmville !